It keeps a measure of the basic factors like heart rate, speed, distance, calories etc. 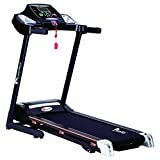 Type: There are two types of treadmills available—the manual and the motorised treadmill. The price difference between the two is about INR6000 to INR10000. Hence the choice definitely depends on the budget. Needless to say that motorised treadmills come with a lot of features and are much more effective than a manual one. Motor and its horsepower: This depends on the weight of the people using the same. Usage by heavier people puts a greater strain on the motor. But instead of the horsepower ratings, the “continuous duty” rating of the motor needs to be checked. 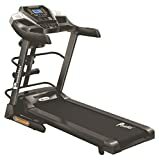 It is also wise to purchase a treadmill which has the longest warranty on its motor. Stability: The treadmill should be checked for both stability and sturdiness before making a purchase. A jerky or unstable treadmill does more harm than good. Cushioning so as to be able to absorb shocks while running. 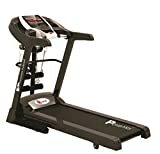 Check for noise and space: These are two very important things that need to be checked since there is nothing more irritating than a noisy treadmill. Also if the same does not sync in with the space available for its installation, it will become more of a hindrance and an eyesore than an object of use. 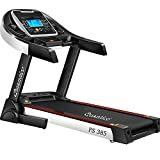 The cost of the motorised treadmill is considerably higher than the one which are not. But the overall price range for the same can be taken to start from INR8000 and go up to even 1.3lace or even more. 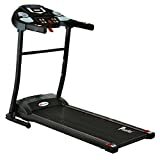 Hence treadmill buying depends as much on its features as on the budget of the customer. It would, however, not be wrong to say that it is a gadget with a very high return on investment. For a fitness lover, an exercise bike is a fantastic tool. With a huge range of types and models available in the market, there is something for everyone. It is wonderful to find how technology has made a simple machine like a bike into a versatile exercising machine. The latest in the series is the magnetic exercise bike. Installation Video readily available on Youtube ; 1 Year JSB National Warranty, Call 08010402110 (Mon to Sat 10 AM to 7 PM) for support.
. On-board LCD Digital Computer Monitor with I pad & Tab holder.
. Display meter with functions: Speed, Time, Calories, Distance & Hand Pulse.
. Adjustable Magnetic Resistance Control System.
. Super Compact & Foldable.
. Comfortable seat with foldable backrest and handle bars. In a magnetic exercise bike, the flywheel has ferrous magnets around that provide the resistance. 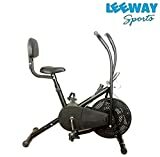 The magnetic exercise bikes proved to be a major advancement and today occupy a major portion of the market. Fitness freaks love magnetic bikes because of their smooth and continuous resistant. Aah. A lot can be said in this category. You would get tough models with a strong steel frame that can hold up to 300 lbs. There are foldable models too. The magnetic tension control system is vital as it offers different levels for more strenuous exercise routines. High-end models would have adjustable seats and handlebars to fit any body size. The most salient feature of a magnetic exercise bike is the smooth change of resistance without any noise. The bikes that are more popular come with the resistance range of 10 to 16. There are high-end bikes that offer up to 20 or more levels. These bikes also come with a higher number of preset workout levels, ideal for people who are serious about their fitness. A magnetic exercise bike is designed for intense cardiovascular workouts and hence the comfort plays a huge role. It is better is the seat and handlebar adjust to your height for a better grip. Some bikes also have adjustable consoles to let the user see the statistics from other angles. Most reputed brands have a few models that offer great features within a reasonable price band. There are a few models that are slightly higher up the ladder but offer hi-tech features too. A sleek machine that offers a lot of variations for intense and interesting workouts – that’s a magnetic exercise bike. Get one today and give your exercise regime a twist. Don’t fret. There are a lot of people like you who do not like visiting the gym. To save yourself from the hassle of going to the gym and yet get your daily dose of exercise, get an air bike. Yes, an air bike is a simple exercising machine that gives you low-impact workout, great for losing weight and getting into shape. Though simple, it is a marvelous tool that most fitness lovers swear by. We Do Not Provide Onsite Installation And Servicing.
. Dual Functional Exercise Bike to work on toning arms & legs.
. Ergonomic adjustable-reach arms with padded grips.
. 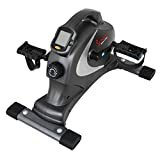 Smooth and quiet full body cardiovascular workout.
. Electronic meter display for distance , time, calories burned & speed.
. User Weight 120 kg. An air bike works on the basic principle of physics. It uses a fan for resistance. The more you pedal the more resistance you face. The fan produces a flow of air that keeps you cool while you exercise. Innovative, right? If you are already tempted to get an air bike for your home, here are the criteria you must look out for. An air bike being simple equipment doesn’t offer much variety in the design department. However, with technology its design has gone through many changes and today you get air bikes in handsome designs that make it an eye-candy. Look for small and compact designs that would fit into your house and also add value to it. As always, you must look for the features in your exercise equipment that align with your fitness goal. Different resistance levels, ease of operation and customization options gets high value in this department. 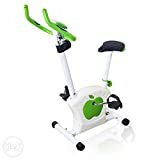 In the market, you would get simple air bikes that give you multiple resistance levels along with the high-end ones with LCD display to monitor your heart rate, speed and calories burned. 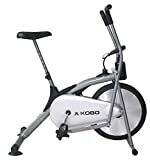 There are also air bikes that have an upright design to synchronize the arms and legs for excellent cardio exercising. No matter whether you use the air bike for a few minutes or an extended period, the comfort level has to be considered. Adjustable foam seats, ergonomic design of the handles and wider blades of the fan ensure your comfort. Air bikes are quite affordable. You would get one from a reputed brand at around 5000rs,,. For more sophisticated ones you have to shell out more. Getting an air bike that is versatile enough to be used by the entire family is a good decision. Make fitness a family goal and enjoy exercising.